Canuck James Hinchcliffe led the field to the restart, enjoyed as Paul Tracy said “the car to beat” and dominated almost the entire race. Crucially though, he occupied the point “until the last lap,” as he dejectedly said afterward. Already one of the longest races in history, it must have seemed doubly long to Hinch after coming so close only to finish second. “Gutted,” is how he succinctly summed up his feelings after climbing from his golden chariot. Side by side, three and four wide racing was in abundance. IndyCar’s limitations on changes to the cars – despite the passage of time and later start, making it a night race – paid off with an incredibly entertaining show. Edge of your seat battles, contact and near misses were common place at speeds in excess of two hundred and ten miles an hour. 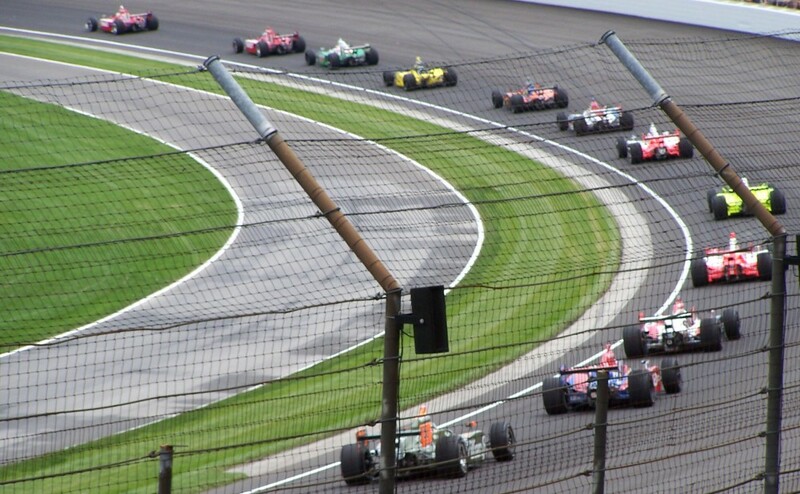 Reminiscent of the Indy 500, Hinch and Ryan Hunter-Reay battled for the lead early on. Rahal advanced to sixth after only fifteen laps as he sliced his way through the field during a long green flag stint. Remarkably, he’d gained ten spots to third after only thirty laps. It was especially evident after the last round of stops that Rahal had the car to win it, as he steadily marched forward through the field yet again. This despite a slow second stop around mid race in which Mr. Courtney Force experienced radio issues requiring assistance. It took the team nearly ten seconds to perform the service, dropping him to eighth. But he didn’t stay there long. On his third stop he nearly collided with both Will Power and Muscovite Mikhail Aleshin on pit road, but escaped unscathed. Three caution flags flew in the Saturday sequel alone, for a total of four plus the red flag during the entire, months long affair. Scott Dixon’s forgettable season got even worse, spinning and crashing into the turn one wall. Careening down the track, he was clipped by Helio Castro-Neves before rolling to a stop. Dixie’s frustration boiled over in the steamy Texas night, pulling a Power and flipping Ed the double bird – even though he was totally innocent in the matter. In fact Dixon’s car got loose, hitting Carpenter and then spinning. Ed said he “felt a light tap” after “giving him fu@*king room,” and was able to continue. “Scott was a little upset. I like Scott. Hopefully he doesn’t stay pissed at me,” he deadpanned from his pit box. Dixon was both furious and wrong, and as of this publication still hadn’t apologized via Twitter. Unfortunately Ed’s luck would soon run out too, as his race would end during the next incident. The second caution of part two came a few laps after another rousing restart when Ed’s car suffered a cut tire and crashed, catching up both Helio and Englishman Max Chilton – who detoured through the grass twice before finishing fifteenth – in the melee. Carpenter had driven beautifully at the front all night, a pilot in desperate need of a finish. In a bit of news Carpenter did say he’d be back in the 20 car next year, this after a dreadful couple of seasons for the series’ only owner-driver. Cautions breed cautions as the adage goes and soon after the restart another was born. The final yellow came with sixteen to go, bunched up the field and set the stage for an outstanding finish. Contact occurred between a spinning Aleshin and trailing Englishman Jack Hawksworth, who had nowhere to go. Aleshin’s effort was particularly disappointing following his strong showing Monday at Pocono, and Jack limped painfully to the safety truck. It put a humane though expensive end to both their misery however, and more importantly gave fans a furious final restart with eight laps to go. Using every bit of the track, Rahal went low onto pit road, then high before diving low again, making his incredible pass for the win on the final lap. It was pure racing ecstasy in Texas. Kevin Lee did an admirable job filling in for a sick Leigh Diffey – who’s suffering from Rio’s Revenge – and a MIA Brian Till. Previously wrecked Daly called it a “huge crowd” during his competent commentating debut, making it clear that he “really likes driving.” It was a bigger turnout than expected for the long delayed conclusion to Texas 2016 and those in attendance weren’t disappointed. Rahal had radioed during the parade laps “my car’s a fu@*ing rocket ship,” which proved to be absolutely fu@*ing correct. He went low to the point of cutting infield grass and took advantage of the high line like no one else over the course of his monumental drive. Rahal raged his way to victory in one of the best races in years. Long live Texas! This entry was posted in Brian Till, Conor Daly, Courtney Force, Ed Carpenter, Graham Rahal, Helio Castro-Neves, IndyCar racing, Jack Hawksworth, Josef Newgarden, Kevin Lee, Leigh Diffey, Max Chilton, Mikhail Aleshin, Paul Tracy, Robin Miller, Ryan Hunter-Reay, Scott Dixon, Will Power and tagged Firestone 600, IndyCar, IRR, irreverent humor, Texas by IndyRaceReviewer. Bookmark the permalink.